I've been a bit busy at work (you know the thing that keeps a roof over my head until my blog is bought out by Blizz for millions :) But now that the 2nd week of Season 6 and many players are starting to eye their first piece of arena gear. Depending on a variety of things last season your gear is probably a mish-mash of Saronite - Deadly gear so I'm not going to go into detail on what to upgrade first, that's going to depend on how good/bad your current gear is and how high you expect your arena rating to hit this season. I will say this - with deadly offset gear requiring no rating, and Deadly core sets rating ranging from between 1250 - 1500, I wouldn't waste time on hateful gear if at all possible. Go straight to deadly and furious offsets. Don't know how you're going to do this season? Look at your rating last season and assume you'll be right around the same. 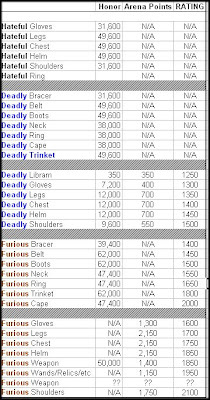 That should help you figure out if you're going for the Furious Bracers at 1400 PR, or sticking with Deadly. Worst case scenario (and most likely for many people) is that you only have a 2v2 team and it's under 1500. That means you'll be waiting between 2-3 weeks to get enough arena points for the core deadly gear, or about 3 months for the full core set. 6 months to deck out both specs. So, the lesson here? Don't burn yourself out, you'll be playing the whole season to gear out. No mad rushes for gear like S5. Blizz has slowed the progression of acquiring top level gear both in PvE and PvP. Not a bad thing in my opinion but a change of pace from what we've seen in WOTLK. thanks for the break down. I really want me a furious libram, but I'll never get it. 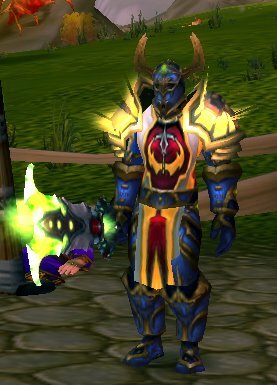 I think the furious armors look pretty cool. Go for the Deadly Libram... Easy to get and a nice upgrade. Awesome! This is exactly what I needed to plan my upgrades!